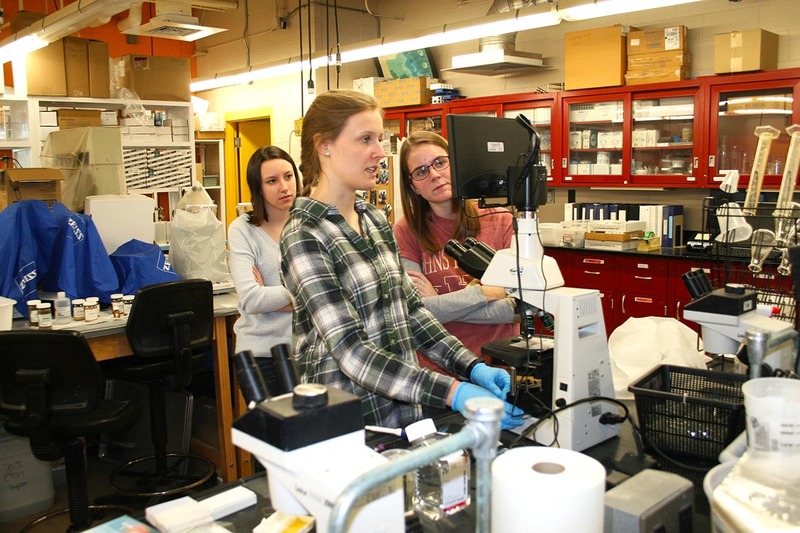 Sara Hunt, a lead author on the report and senior biology and chemistry double major at RWU, demonstrates how to examine the fish blood specimen under a microscope to undergraduate student researchers in RWU’s Wet Lab. 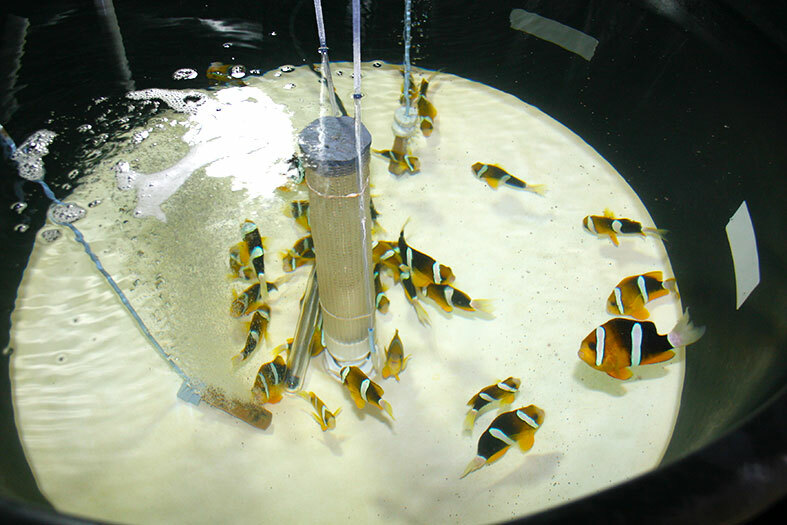 BRISTOL, R.I. – As a critical step in developing the first test to help reduce the destructive and illegal trade of cyanide-caught marine fish, Roger Williams University professors and undergraduate student researchers have measured the residence time of an important metabolite in the blood of marine fish after cyanide exposure. For decades, the scientific community has been seeking a solution to identify fish caught by cyanide. The most recent focus had been on trying to detect a metabolite in the water of the captured fish. But two years ago, RWU researchers Andrew Rhyne and Nancy Breen proved that method to be erroneous. That’s when Rhyne and Breen realized that they needed to go to the source, and look within the fish. On April 2, PeerJ published the RWU researchers’ report, “On the half-life of thiocyanate in the plasma of Amphiprion ocellaris: implications for cyanide detection,” co-authored by Rhyne, RWU Associate Professor of Chemistry Nancy Breen, John Alex Bonnano ’17, senior biology and chemistry double major Sara Hunt, sophomore marine biology major Julia Grossman, Jordan Brown ’18, and Hannah Nolte ’18. 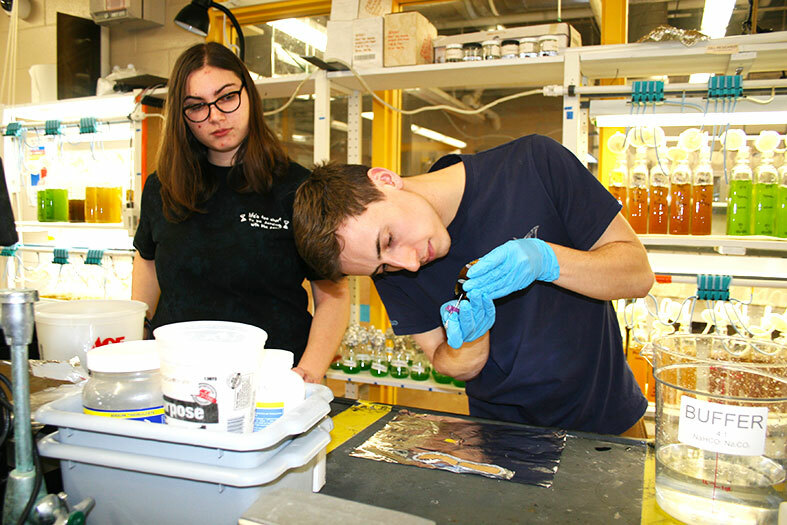 “Working on the cyanide project has taught me a great deal about the importance of careful planning, attention to detail, problem solving, and collaboration in a marine biology and chemistry setting. So far, these skills have helped me tremendously in job interviews and in off-campus clinical positions, and will continue to benefit me in clinical- or laboratory-based roles and in physician assistant school in the future,” said Hunt, who also works part-time as a medical scribe at a hospital. John Alex Bonanno ’17 draws a blood sample from a sedated clownfish, while undergraduate student researchers observe and learn the process. 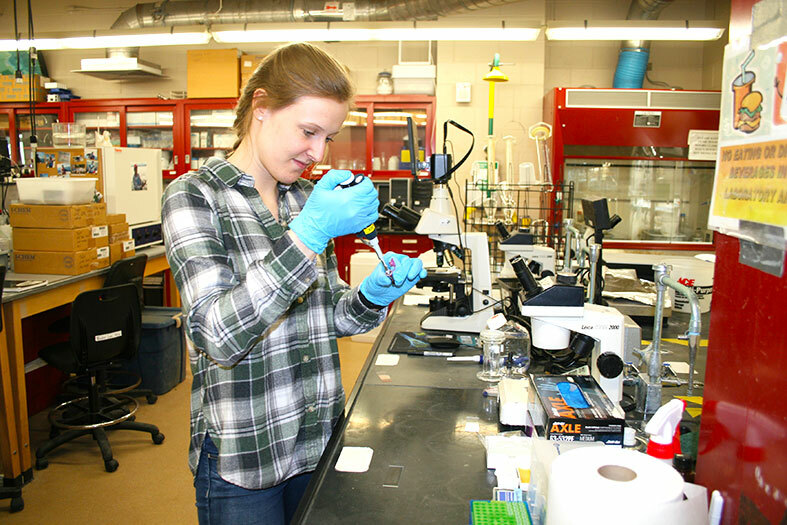 “This project has exposed me to many aspects of chemical analysis, broadening my skill set. I can put that on my résumé, which will make me very marketable for any job in the biotech and pharmaceutical industries around Boston,” said Bonnano, who hopes to complete his master’s degree in marine science and technology in December. Read the open access article, “On the half-life of thiocyanate in the plasma of Amphiprion ocellaris: implications for cyanide detection,” available online now via PeerJ.